I’ve been looking forward to watching this eclipse for months. I love bizarre, dream-like experiences where the normal rules of life don’t seem to apply. Like when I was in Thailand, exploring a semi-abandoned mall, where I’d walk through movie theaters and ice rinks and no one was there. Or when the floods of 2012 blocked roads and filled the play structure at school. Disasters seem kind-of exciting to me, just so long as they’re not too disastrous. Because then the normal rules of life are turned on their end. Everyone thought that this eclipse would be the traffic event of the century. Huge numbers of people from California and Washington were expected to flock to our slice of the valley. “It’s WAY over-hyped,” my cousin Randy scoffed. But Dad and Ben still discussed the best back roads to take to my Aunt Rosie’s house, where we planned to have a Smucker eclipse-watching party. 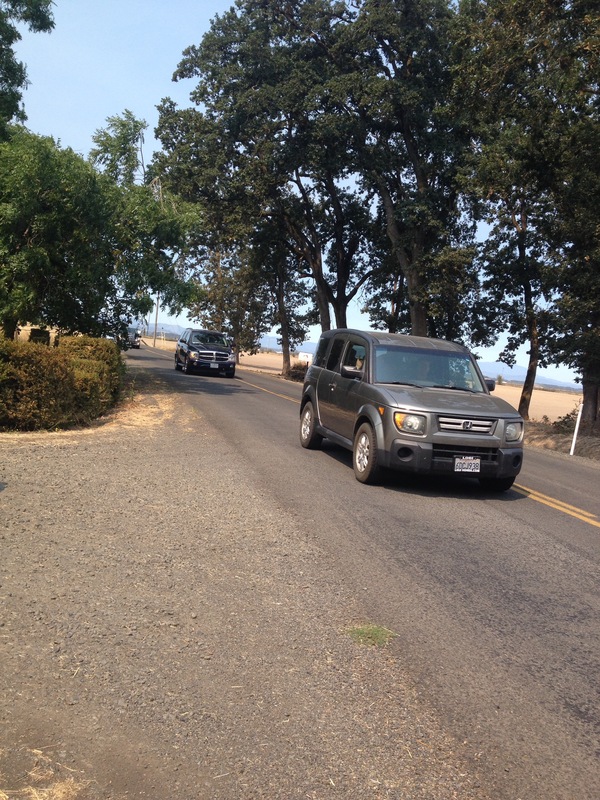 I even dreamed, one night, that there was so much traffic it clogged the little country roads next to our house. But in the end, it seemed Randy was right. Over the weekend, the nearby towns were completely dead. “Maybe they’ll start zooming in Sunday night,” we thought. But as we drove to Rosie’s Sunday evening, even I-5 was barely busier than usual. 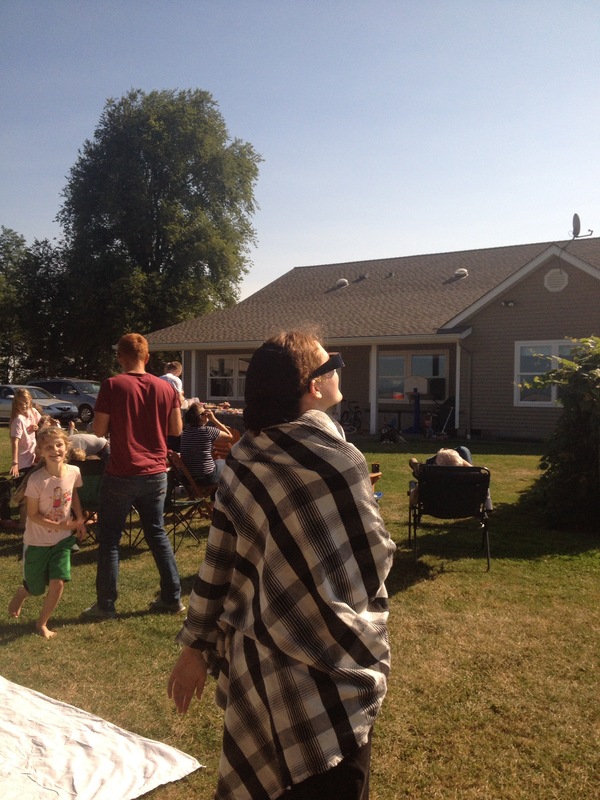 Many of us Smuckers live just below the line of totality, which is why we all congregated at Rosie’s, a half hour north of us. There were siblings and cousins, great-aunts and second-cousins, and an 100-year-old man who wasn’t a Smucker, but slipped in because his daughter married one. Matt showing us how the eclipse works, why it’s rare, and how it moves. We ate hamburgers and hotdogs, and discussed politics and spiritual gifts. Randy tried not to gloat about how his “over-hyped” prediction came true. In general, we had a typical Smucker family gathering. But then, instead of going home, we spread our sleeping bags out on the grass and watched the stars until we fell asleep. The Smuckers chilling in the Sunday evening sunset. I don’t usually sleep very well outdoors, but in the last two or so hours before I woke up in the morning I fell into a heavy, solid slumber. And then suddenly, I was awake, and all alone. Everyone who’d slept around me had gone inside. And then I looked over, and there was a cup of tea beside me, steaming hot. My first surreal moment of the day. 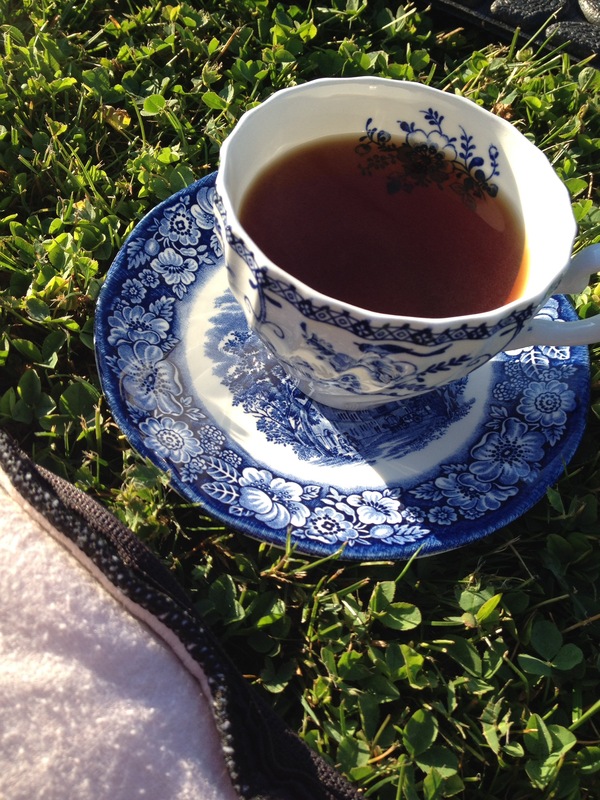 Alone in the brilliant sunshine with my tea and a book I’d kept under my pillow all night, I had no rush to get up. I just basked in the warm comfort. It was my mom, of course, though I still don’t know how I didn’t wake up once when everyone left and when she delivered the tea. All I can say is that walking on grass is a lot quieter than walking through our old farmhouse. Cousin Justin, his wife Kayla, Aunt Bonnie, and baby Crosby. I looked through my own glasses. He was right. One side of the sun was ever-so-slightly flat looking, and then even flatter looking, and then it wasn’t a flatness at all but an actual little bite. Intermittently, we’d stare at the sun, and then take our glasses off for a bit to chat with each other, eat some brunch, or sip some tea. Every time I put my glasses back on I was amazed at how much more of the sun was covered. First it looked like pac-man, then a cartoon-ish moon, and then it started looking like a fingernail moon. “Is it growing darker?” we asked each other. It was hard to tell. “Well, not darker, but it is colder. I’m sure of it.” I put my jacket back on. “It doesn’t seem weird to us, because we’re so used to dim light from our constant cloud cover,” someone joked. And indeed, it did rather look like a slightly overcast day, except for the sharp shadows. And then the real weirdness began, as the shadows changed shape. 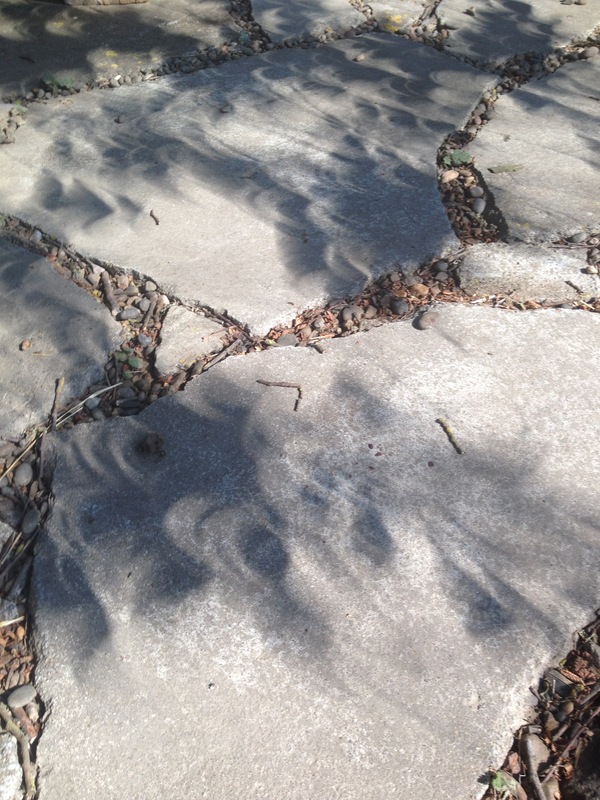 The shadows of the leaves formed little crescents, like a pattern of scales spread across the patio. My second-cousin Tristan splayed his fingers. “Look, I’m Wolverine!” He exclaimed, as little shadow lumps formed between the long shadows of his fingers. “Shadow snakes! There are shadow snakes!” Jenny exclaimed. She’d spread a white sheet on the ground for this express purpose. And indeed, there they were, strange squiggly shadows flittering across the white expanse of the sheet. Finally, it was getting visibly darker. “Are we going to have to go to bed when it gets dark?” Jocelyn, my cousin’s daughter, asked, worried. I whipped off my glasses. “gulp!” The sun was gone. And then a bead of brilliant light appeared at the edge of the blackness, and we all looked away again, back to the white sheet and the shadow snakes. And then, just like that, the world was light and bright again. The moon-shaped sun in the eclipse glasses getting bigger and bigger wasn’t nearly as exciting as when it got smaller and smaller. Jenny had to go to work, and before too long, the rest of us had rolled up our sleeping bags and headed back home. “Hey look.” Matt jerked his chin towards a north/south side road east of I-5. “There’s traffic on 7 mile lane.” I looked and saw seven or so cars at the stoplight. Maybe there was a bit of traffic after all. Then we were on the overpass, and looking down we saw that I-5 itself was WAY too busy to take home. Traffic! My heart was happy. There were a lot of people here for the eclipse. We decided to take 99E home, but when we ran into traffic in Shedd, we took a side street and ended up going home via about three different winding back roads. And as we drove I put my eclipse glasses on periodically and watched the sun become a cartoon moon again, and then a pac-man, and then a tiny bite that turned into a flat spot on the sun’s round surface, and then disappeared. But when those cars had passed, more cars came. I carried in sleeping bags and pillows, but kept getting distracted by the weirdness of those cars. A few would come, and then you’d think surely that had to be the end, and then a few more would come. They mostly had California license plates. I was so fascinated that I brewed some tea and sat in a chair out by the road, people watching. How often do you have a chance to people watch from your own yard? I walked into the front yard, then, where I met Matt coming out the front door. 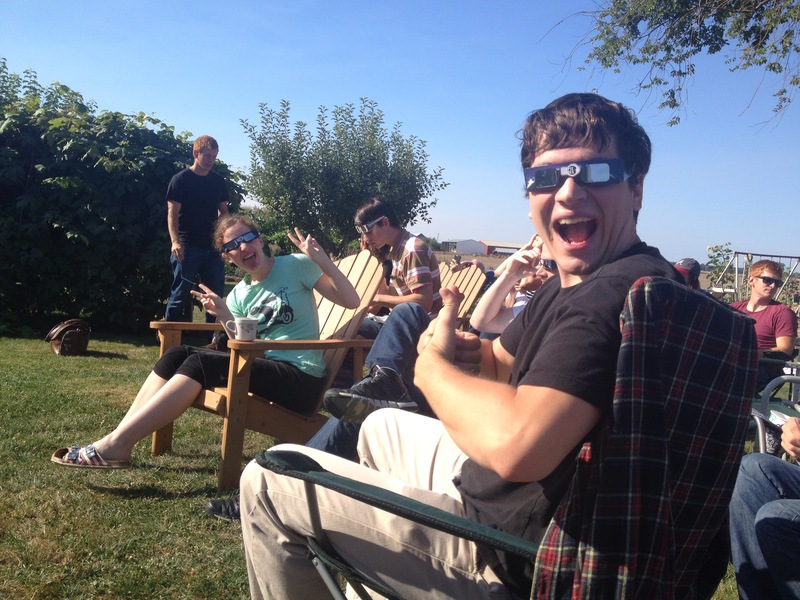 Matt had flown home from DC just to watch the eclipse with us. And as we stood there and marveled at how the traffic was just getting worse and worse, a legitimate cars-stopped traffic jam happened right there at the intersection in front of our house. It looked exactly like the bizarre scene from my dream. We could. not. believe. it. Suddenly, Matt, at 31, and I, at 27, reverted into the giddy teenage versions of ourselves. He began filming a Facebook live video, and then we impulsively decided to walk down to the warehouse and climb to the top, to see if we could get a better view of the traffic. So off we went, waving to people, counting how many license plates were from California vs. other states, and filming Facebook Live videos. We got very dusty climbing to the top of the warehouse where we had good views of nature but not much of a traffic view. Then we decided to stop in and visit our neighbors/relatives Darrell and Simone, and their children Dolly and Tristan, but no one seemed to be home. When we got back to our house the traffic had reached unbelievable levels. 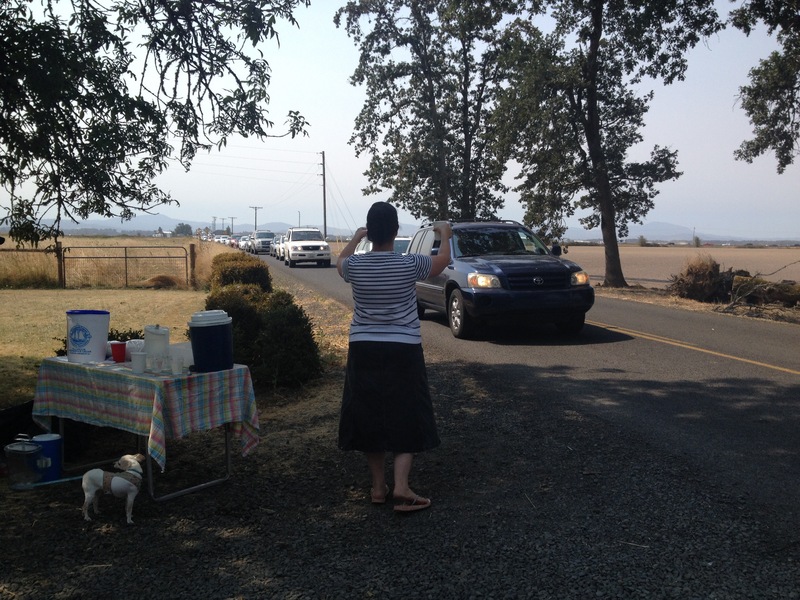 There in our driveway was Simone, handing out glasses of lemonade and iced tea to the people driving by. “Free iced tea and lemonade!” she yelled. Mom dashing inside to make more lemonade. And help was certainly needed. We made gallons of iced tea until we ran out of ice, and then mixed up gallons and gallons of lemonade. We found paper cups and purple plastic cups and Styrofoam cups from the back corners of our pantry. We found cookies, and muffins that were leftover from our morning brunch. “What I really need is a bathroom,” one woman confessed. So we made a new sign. “Restrooms Available!” And soon had a long line stretching all the way out our back hallway. Matt sat in the living room and directed people to our upstairs bathroom, while Mom showed people where the downstairs bathroom was as she mixed up batches of lemonade. Soon we had groups of people in our driveway chattering in Chinese, as children swung on our ancient tire swing. So I rode my bike to her house, skimming past the cars as I rode along the shoulder. She was right. She did have a lot of cups. “Do you have a bag I can put these in?” I asked Dolly, who was sitting in the living room with her dog, Bailey. “Well, I’m not wearing a head covering,” said Dolly. She grabbed one of her dad’s ancient baseball caps from a hook in the mud room. I found a utility-sized garbage bag and stuffed it with packages of cups. “How am I supposed to get these home on my bike?” I asked Dolly. “Maybe we can take the 4-wheeler,” she said. I didn’t know how to drive a 4-wheeler, but people needed drinks and drinks need cups. So I climbed onto the seat of the 4-wheeler, and Dolly climbed on behind me, somehow managing to hold her dog and the gigantic bag of cups in her short arms. She told me how to drive the thing, and we zoomed home. Halfway there I saw, in my peripheral vision, Dolly’s hat go flying off her head. 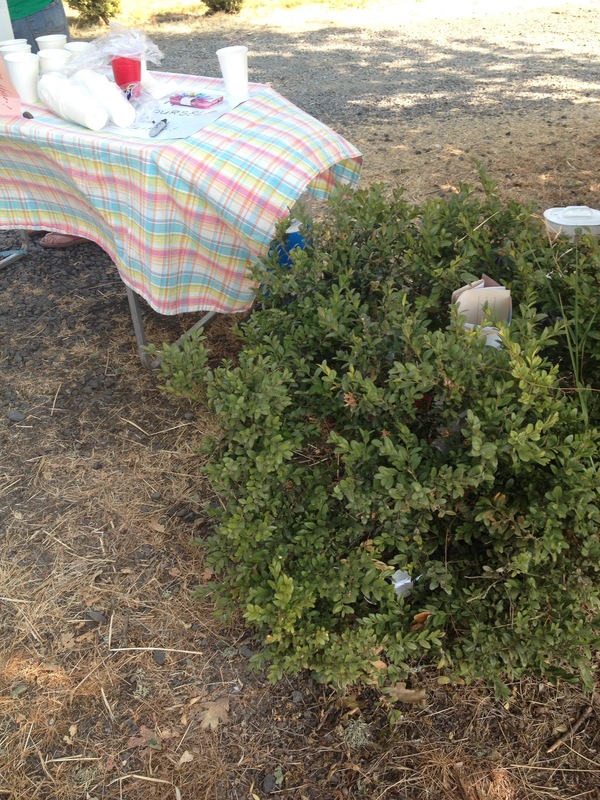 I parked beside the pump house and ran to start filling cups with lemonade again. Dolly came to help, and I saw that she was wearing a baseball cap. “Didn’t that fly off your head?” I asked. “I caught it,” she said. How she managed to catch her hat while holding a dog and a giant trash bag full of cups is something I will never understand. Bailey was a big hit among the people who came. “Can we pet her?” they’d ask, and Dolly or Simone would explain that she was a rescue dog, and shy of people. But still we gave them drinks and they used our bathrooms. Mom made tea until she ran out of ice, then lemonade until she ran out of lemonade powder, and finally we just handed out water and whatever odd grocery depot macaroons and brownie bites we could find. I felt like Jacob who just happened to have some stew, and here were these desperate Esaus who were willing to give up their entire birthright for a cup of lemonade and a chance to use the bathroom. “Why are you so nice?” They asked, pressing money into our hands even though we insisted it was free. But honestly, this was the kind of thing I literally dreamed about. The most surreal experience, and the most exciting thing to have happened in our backyard since ever. There were so many weird elements to our day. Like, we didn’t have a trash can, so whenever we had a broken cup or a dirty cup or a sign that said “iced tea” even though we’d run out of iced tea, we just shoved it into the hedge. The dry, ugly hedge bush was surprisingly good at holding trash. “I’m done with this,” shall I put it in this trash bag?” one guy said, after stopping to use the bathroom and get a drink. He held up his dirty paper cup. “No, that’s full of clean cups. Put it in this bush,” we said. Then suddenly, there was a gap in the traffic. The first gap since…two hours ago? Four hours ago? What was time, even? We took breaks, with only one person manning the table at a time. Simone left, taking me with her, and I rode home the bike that I’d left at Darrell and Simone’s when I got the cups. The trickle grew less and less, like a waning eclipse, and then we abandoned the table all-together, figuring that if some lone car came by they could stop and help themselves. Mom pulled together something for supper. Jenny came home from work, disappointed that she’d missed all the excitement. We rested. We processed. 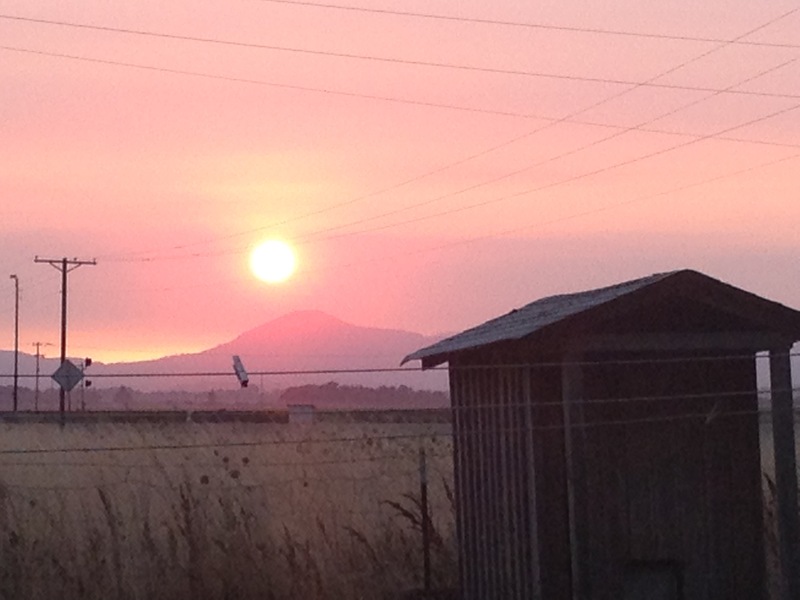 And the Sisters’ Forest Fire filled the sky with a hazy smoke, and the sun set, large and red, over the coast range. 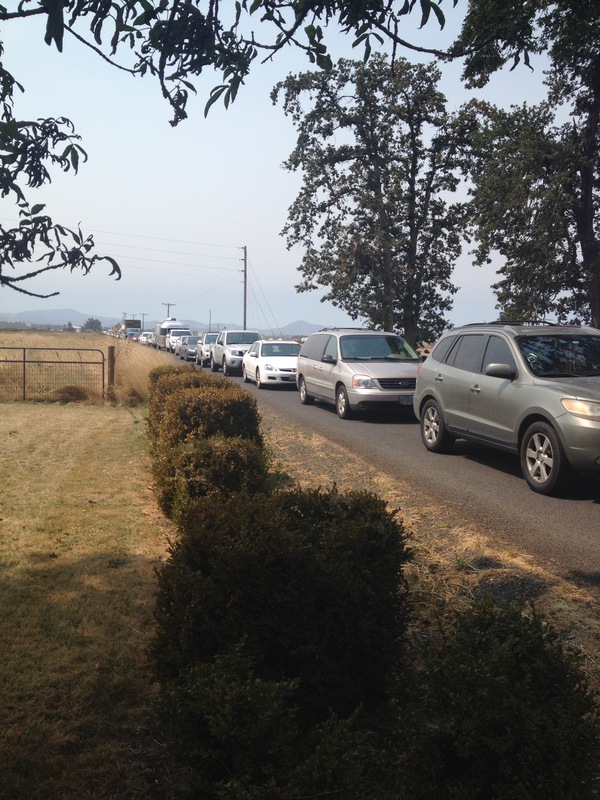 This entry was posted in Stories and tagged eclipse, eclipse2017, Oregon, surreal, total eclipse, totality, traffic. Bookmark the permalink. This is a great blog post of a great way to live the Jesus life on a great day! I became more and more enthralled with your experience as I got more and more into it. Thank you, Emily, for writing this. And thank you, Paul and Crew, for challenging me and blessing me in this way. Loved this post. Sure wish I could have been there too! I really, really enjoyed your account! And now that I’ve just read Annie Dillard’s “Total Eclipse” at the Atlantic, I’m wondering if you’d enjoy it too. Thank you for the recommendation, I’ll go check it out! Love that essay! Annie Dillard is the best – read the essay “Living Like Weasels” too; it’s better. An absolutely FASCINATING experience. I love that the shadows changed, and that you described it for us. And I love that you all opened up your house as a rest stop.That is just so NICE! Loved it. Thank you for sharing and letting your light so shine before man, that they see your good works and glorify your Father in heaven. Thank you for the wonderful account of your totality day. I love the pictures, especially the last one of the setting sun punctuate your story. I have just one question that I have to ask…..
😳 Did you have enough toilet paper? This is hilarious! Where was grandpa during all the excitement? He slept through most of it, and then woke up and was very confused about all the people walking through the house. So mom tried to explain by hollering at him in PA Dutch, much to the fascination of our guests. Then he went outside and watched traffic for a long time, fascinated. It was very nice that you could experience this day, and were able to show some great hospitality! I enjoyed the partial eclipse with glasses in Columbus, but not photos, since I left the filter for my camera at home buried under a notepad on my desk! The trade off for cleaning up the clutter on my desk before leaving for our last trip! 😦 🙂 Thanks for posting, and using your creative writing skills to make it a great read! We spent the weekend in north GA, celebrating my sister’s fortieth birthday and then a ‘surreal’ day beside Lake Murray in S.C. as we watched the eclipse. The children swam and boated, coming ashore frequently to don their sun glasses and check progress. Finally we all lined the dock to experience the awesomeness of God’s design…. Then we joined the throngs of TRAFFIC heading North, home to the Shenandoah Valley. Even though it took ten hours instead of the usual seven, everyone agreed that it was ‘totally’ worth it!